FINAL results in all 27 governorates aggregated by Ahram Online shows that with about 43.4 per cent turnout, the Muslim Brotherhood's candidate Mohamed Morsi kept the first place, followed by Ahmed Shafiq, Mubarak's last prime minister, while the Nasserist candidate, Hamdeen Sabbahi, stayed in the third rank. 20:05 FINAL results are in from Cairo for the top four candidates, according to Al-Ahram's Arabic-language news site. Combined votes for these four are equivalent to 44.2 per cent of the total number of voters registered in the governorate. Table showing results of all 27 governorates. 19:15 FINAL results are in from Giza governorate, according to Al-Ahram's Arabic-language news site. Turnout of voters in one of the three greater Cairo governorates is around 47.6 per cent, out of a total of 4,289,421 registered voters. 18:25 Ahmed Khairy, the official spokesman of the liberal Free Egyptians Party, described the expected two-horse race between Mohamed Morsi and Ahmed Shafiq for Egypt's presidential seat as "the worst-case scenario". Khairy branded the Muslim Brotherhood's Morsi as an "Islamic fascist" and former prime minister Shafiq as a "military fascist". "It will be very hard for the party to endorse any of the two candidates. The party will either boycott the elections or allow its members to choose freely as individuals," he added. 16:30 FINAL Results in 25 governorates aggregated by Ahram Online shows that with about 41.8 per cent turnout, the Muslim Brotherhood's candidate Mohamed Morsi remains in the lead, followed by Ahmed Shafiq, Mubarak's last prime minister, while the leftist candidate, Hamdeen Sabbahi, who proved to be the dark horse of the race, fell back to third place. Still waiting for Cairo and Giza results, which will be decisive. 15:55 FINAL results are in from Qalioubiya governorate, according to Al-Ahram's reporters at the headquarters of the Supreme Presidential Elections Commission (SPEC). Turnout of voters in the southern Delta governorate reached around 49.7 per cent, out of a total of 2,606,058 registered voters. 15:30 FINAL results are in from the Upper Egypt governorate Assiut, according to Al-Ahram's reporters in Assiut. Turnout of voters in Assiut reached around 32.6 per cent, out of a total of 2,087,308 registered voters. 15:34 FINAL results are in from the governorate of North Sinai, according to Al-Ahram's Arabic-language news website. Turnout of voters in North Sinai reached around 41 per cent, out of a total of 207,906. 15:25 For the first time in history, Egyptians across the nation are choosing their president in a free election. As the final results come in, the field has narrowed to three: the Muslim Brotherhood candidate Mohamed Morsi, Mubarak-era minister Ahmed Shafiq and Nasserist Hamdeen Sabbahi. However, significant questions remain. Without a constitution, it remains unclear even what powers the new president will have. The Egyptian constitution was dissolved after the ouster of Mubarak in 2011, and the ruling military council has been ruling with an interim constitution after a referendum in March of the same year. After the dissolution of the body tasked with drafting the country's new constitution, Egypt remains without a constitution. Analysis: Can Egypt have a president without a constitution? 15:00 Egypt is currently waiting for the results of Cairo, Giza, Asiut, and Qalyoubiya governorates. The four governorates include one third of the total registered voters (15 million and 480,674 voters). 14:20 FINAL results are in from the Muslim Brotherhood's birthplace Ismailia governorate, according to Al-Ahram's Arabic-language news website. Turnout of voters in the Suez Canal governorate reached around 48.9 per cent, out of a total of 700,515 registered voters. 14:34 FINAL results are in from the southwestern governorate of El-Wadi El-Gedid, according to Al-Ahram's Arabic-language news website. Turnout of voters in El-Wadi El-Gedid reached around 36.9 per cent, out of a total of 141,959. 14:00 FINAL results are in from the Fayoum governorate, according to Al-Ahram's Arabic-language news website. Turnout of voters in Upper Egypt governorate reached around 38.8 per cent, out of a total of 1,554,788 registered voters. 13:30 Final results aggregated by Ahram Online of counted votes in 18 out of 27 governorates (Daqahliya, Sharqiya, Alexandria, Beheira, Gharbiya, Minya, Sohag, Menoufiya, Kafr El-Sheikh, Qena, Beni Suef, Aswan, Damietta, Luxor, Port Said, Suez, Red Sea and South Sinai) show that with 41.6 per cent turnout, Brotherhood candidate Morsi is in first place, followed by Mubarak's last prime minister Shafiq, while the Nasserist candidate Sabbahi, the surprise of this election so far, has fallen back into third place - after the totals of Sharqiya and Sohag governorates were announced. Table showing results of 18 governorates. Daqahliya, Sharqiya, Gharbiya and Menoufiya are the weights behind Shafiq's lead. 13:20 Final results are in from the Upper Egyptian governorate of Sohag, according to Al-Ahram's Arabic-language news website. 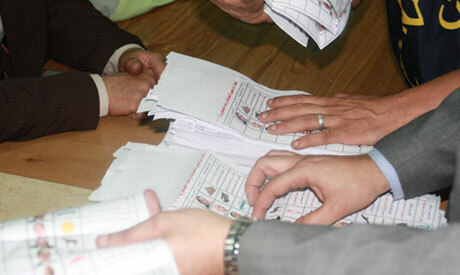 Turnout of voters in Sohag reached around 27.3 per cent, out of a total of 2,347,958 registered voters. 13:15 Final results are in from the coastal Red Sea Governorate, according to Al-Ahram's Arabic-language news website. The popular touristic governorate achieved a 40.4 per cent turnout out of 225,218 registered voters. 12:50 Final results are in from the large working class Imbaba district in Giza governorate, according to CBC Satellite TV channel. Imbaba is a traditional stronghold of Salafists. The Salafist Nour Party and Al-Jamaa Al-Islamiya's Building and Development Party, as well as the ultra-conservative Salafist Call and Al-Jamaa Al-Salafiya had previously announced their intention to support to Islamist Abul-Fotouh after the disqualification of Salafist Hazem Abu-Ismail from the presidential race. Despite this, Nasserist candidate Hamdeen Sabbahi is reported to have won the most votes in the district. A total of 239,485 voters cast their ballots. 12:40 FINAL results are in from Sharqiya governorate, according to Al-Ahram's Arabic-language news website. Sharqiya is the fourth largest governorate in terms of registered voters. A total of 1,666,193 voters cast their ballots with a turnout of 47.6 per cent. 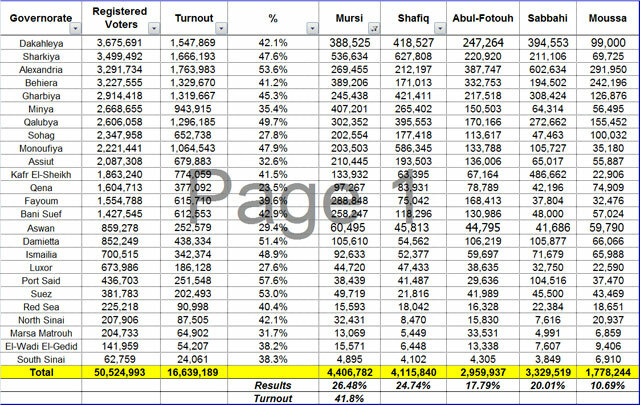 12:35 Final results aggregated by Ahram Online of final vote counts in 15 different governorates show a total of 11,088,494 voters cast their ballot in these governorates with a turnout of 42 per cent. 12:10 The presidential campaign of the Muslim Brotherhood's Freedom and Justice Party candidate, Mohamed Morsi, announced on the group's official website that after counting 90 per cent of the total votes around Egypt's governorates, Morsi is still leading the race. The campaign claims that the runoffs will be between Morsi and Ahmed Shafiq, according to the numbers they boast. The Freedom and Justice Party, the political wing of the Brotherhood, will hold a press conference on Friday night to announce the latest updates. The exact time and location of the conference are yet to be announced. 12:01 Final results are in from the coastal governorate of Alexandria according to Al-Ahram's Arabic-language news website. Alexandria is the fifth largest governorate in terms of registered voters. A total of 1,761,000 voters cast their ballots with a turnout of 53.5 per cent. 11:46 Near final results are in from the Upper Egypt governorate of Luxor, only with the exclusion of the city of Al-Qarna, according to Al-Ahram's Arabic-language news website. A total of 186,128 voters cast their ballot with a turnout of 27.6 per cent. 11:55 On Friday morning, presidential frontrunner Ahmed Shafiq expressed his gratitude to all voters who chose him over the course of two days of voting in the first post-Mubarak presidential elections. On his official Facebook page, Shafiq also promised that if he wins he will ensure that Egyptians live in a climate of freedom. "To the generous people of Egypt, justice will reign," Shafiq said. "All thanks and appreciation for your efforts in supporting me as a candidate," he continued. The administrator of Shafiq's page also directed a few words to rival presidential candidate Hamdeen Sabbahi. "The Shafiq campaign salutes the honourable Sabbahi, and God bless him. If he wins we will not be upset because he is a patriotic man." 11:50 The presidential campaign of the Muslim Brotherhood's Freedom and Justice Party (FJP) candidate Mohamed Morsi announced on their official website that with 90 per cent of the total votes across Egypt's governorates counted, Morsi is still leading the race. The campaign said that "according to the numbers we have" they can confirm that the run-off will be between the Brotherhood leader Morsi and Mubarak's last prime minister Ahmed Shafiq. FJP leaders and representatives from Morsi's campaign will hold a press conference on Friday evening to announce the latest updates, with time and place to be announced later Friday. 11:38 FINAL results are in from the Delta governorate of Menoufiya, according to Al-Ahram's Arabic-language news website. A total of 1,064,543 voters cast their ballot with a turnout of 47.9 per cent. Worth mentioning that Menoufiya is the home town of former presidents Hosni Mubarak and Anwar Sadat. 11:30 Dark horse Hamdeen Sabbahi's official Facebook page has just announced, in response to the incoming ballot results: "If God forbids it and we don't make it to the runoffs, we will be honoured to have supported the right candidate. We stood by him, we are honoured to be members of his page, we will continue until the dream to live in a country with dignity, pride and security comes true. Our greetings to all honourable patriots." The official page administrator also stated: "We are still dreaming of a better future, there is still hope. Only 55 per cent of the results have come out. We still have 45 per cent to go. Who has hope like me? I am sure the eagle [Sabbahi's voting symbol] is in the runoff." 11:05 According to state news agency MENA, members of the Carter Center, a US-based NGO that focuses on international democracy promotion, praised Egyptian authorities on Friday morning for their precautions taken to ban violations during the first round of the presidential elections, in contrast to those which members had witnessed in the recent parliamentary elections. Based on their nationwide observation at polling stations, Carter Center monitors stated that the presidential elections have been much more organised and much smoother than they observed at polling stations in Alexandria during the parliamentary elections. The Carter Center will provide a report after the vote count in all governorates is finished. The report will touch on the electoral process, campaigning, and the voting from the beginning of the first round until the announcement of the official results. 10:38 FINAL results are in from the Upper Egypt governorate of Beni Suef, according to Al-Ahram's Arabic-language news website. A total of 612,553 voters cast their ballot with a turnout of 42.9 per cent. 10:25 In a phone conversation this morning, Nesma Youssef, the representative of Abul-Fotouh's campaign in 6 October City, located on the outskirts of Cairo, described to Ahram Online how she felt, as incoming results indicate a two-horse race between Morsi and Shafiq. "I didn't sleep until 4am," she said. "How did Shafiq get all these votes? Really, how? I am extremely depressed. I will pray that Hamdeen Sabbahi and Abul-Fotouh will be cursed for leaving us to choose between Shafiq and Morsi in the runoffs. "One of them should have stepped down for the other, just like Abdallah El-Ashaal helped Morsi in polling stations. We wouldn’t have lost. I am in shock. "Hamdeen did really well among all governorates; he came in first place in 6 October, and Abul-Fotouh came second. Morsi and Shafiq trailed way behind in fourth and fifth places respectively. I don’t know what to do." 10:20 BREAKING: The central campaign of the Brotherhood candidate, Mohamed Morsi, announced at a press conference that the results they have indicate Morsi will compete with Shafiq in the presidential election runoffs. 9:55 FINAL results are in from the country's sixth largest governorate of Beheira – in terms of registered voters, according to Al-Ahram's Arabic-language news website. A total of 1,329,753 voters cast their ballot with turnout reaching 41.2 per cent. 9:10 FINAL results are in from the Upper Egypt governorate of Aswan, according to Al-Ahram's Arabic-language news website. A total of 252,579 voters cast their ballot with a turnout of 29.4 per cent. 8:32 FINAL results are in from the eighth largest governorate of Minya – in terms of registered voters, according to Al-Ahram's Arabic-language news website. A total of 943,915 voters cast their ballot with a turnout of 35.4 per cent. 8:24 FINAL results are in from the Delta governorate of Kafr El-Sheikh, according to Al-Ahram's Arabic-language news website. A total of 774,059 voters cast their ballot with a turnout of 41.5 per cent. 7:57 A Brotherhood official tells Reuters that Morsi and Shafiq will compete in June's run-off vote. 7:37 FINAL results are in from the country's third largest governorate of ‪Daqahliya, according to Al-Ahram's Arabic-language news website. A total of 1,685,399 voters cast their ballot with turnout reaching 42.1 per cent. It's another tight contest, as Sabbahi continues to suprise, while Abul-Fotouh's and Moussa's poor performance is also raising eyebrows. The rise of military-man Shafiq is yet another surprise. Morsi's sizeable electoral gains, however, were not unexpected. 7:29 For more information on tonight's frontrunners, click here. 7:18 FINAL results are in from Cairo's Sahel district, as announced by it's general electoral committee. The district, which boasts a significant Coptic Christian population, saw 201,052 voters cast their ballots, thrusting Shafiq into a comfortable lead. 7:06 Good morning to our colleagues at Egypt's state news agency, MENA. With yet another salute, they begin their coverage. 7:03 FINAL results are in from the coastal governorate of Suez, according to Al-Ahram's Arabic-language news website. A total of 207,891 voters cast their ballot with turnout reaching 54.5 per cent. 6:43 Some Egyptian TV stations have reverted to the black and white films of yesteryear. Who can blame them? The counting process has markedly slowed. Evan Hill seems to agree, tweeting: Time to sleep. If it took 8 hours to get 50% of results in, when I wake up hashoof el ra2is il gai fi masr. Four governorates out of Egypt's 27 have thus far submitted their final results with Abul-Fotouh entering the fold, coming on top in the governorate of Damietta by a very slim margin. In the Upper Egyptian governorate of Qena, Brotherhood darling Morsi overpowered military-man Shafiq by 3.6 per cent. 6:04 FINALresults are in from the Upper Egyptian governorate of Qena, according to Al-Hayat TV. A total of 377,092 voters cast their ballot with turnout reaching 23.5 per cent. 5:42 FINALresults are in from the coastal governorate of Damietta, according to Al-Hayat TV. A total of 438,334 voters cast their ballot with turnout reaching 51.4 per cent. It could be the closest contest yet. 5:23 Dawn is breaking across Egypt, but election officials are still hard at work tallying votes. Of the country's 27 governorates, only two have submitted final results. Moussa, who seems to be struggling elsewhere in the country, captured a decisive win in Egypt's smallest governorate, South Sinai. In the nearby governorate of Port Said, Sabbahi trounced his rivals, garnering twice as many votes as the next most popular contender. The Brotherhood, however, continue to proclaim their man's dominance, placing Morsi ahead with a comfortable margin in their latest tabulation. 4:51 The Freedom and Justice Party says on their official Facebook page that they will soon announce the final results from 6,661 polling stations. 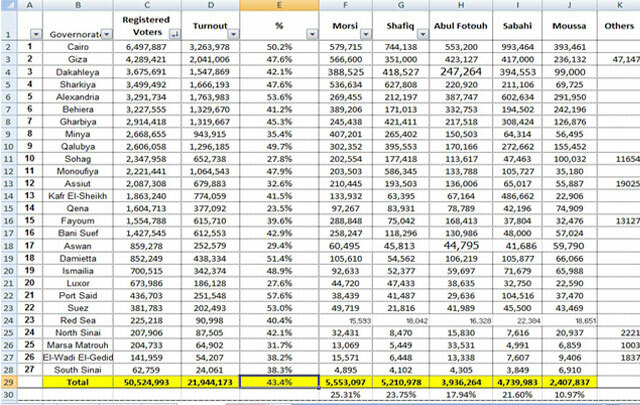 4:43 Here are the largest ten governorates in Egypt by numbers of registered voters. Altogether they make up 69 per cent of Egypt's total 50.5 million constituents. 4:06 Egyptian state run news agency, MENA, called it a night at 3:30am, signing off with "We salute you and end our coverage." Apparently the sandman got the best of them. Ahram Online's team will be here till the bitter end. 3:09 Is there something in the water? Two of Egypt's seaside governorates appear to be going against the tide, plumping for Sabbahi over Morsi. Khaled Elgindy tweets: Morsy-Shafiq run-off is the battle MB has been waiting for. Morsy-AbulFotouh run-off is the battle MB desperately wants to avoid. Mosa'ab Elshamy tweets: Not blaming Copts for Shafik's rise but two Qs: 1. Why not a non-Islamist Sabahi? 2. Didn't the "secular", military man Mubarak oppress you? su zee tweets: Dear Egyptians freaking out on twitter, calm down. Remind urself: u survived Mubarak. U made a revolution. U can survive the next president. And our very own Hani Shukrallah tweets: Look at it this way: If Morsi wins MBs will be finished in 2 yeas; if Shafiq wins, Mubarak regime will be finished by next Jan.
1:04 The Freedom and Justice Party have released voting results from 236 polling stations across 16 governorates, showing their contender well in the lead. There are more than 13,000 polling stations countrywide. 12:09 The Brotherhood's fortunes are less rosy in Cairo's upscale district of Zamalek, reports Ahram Online's correspondent Osman El-Sharnoubi. Morsi received 89 votes out of a total 3,165 in polling station no 4 in Zamalek. Moussa came first with 1,086 votes followed by Shafiq with 787, Sabbahi with 625 and Abul-Fotouh with 467. 12:01 Morsi is enjoying a comfortable lead in the Upper Egyptian governorate of Sohag after 51 polling stations finished tallying their votes. Morsi gathered 12,209 votes, while Abul-Fotouh trailed with 6,820 votes. Shafiq came in at a close third with 6,330 votes; Moussa fourth with 5,106; and Sabbahi fifth with 1,588. 23:57 El-Erian states that Morsi's presidential programme, entitled the 'Renaissance Project', will be set into motion in a few days. Using typically grandiose rhetoric, the leading Brotherhood member states Egypt now stands on the cusp of a new era. "These elections are being followed not only by Egyptians and Arabs, but the entire world is waiting with bated breath for the results," El-Erian states. "Egyptians have proved that they are capable of forging a new history for their country." Sounding assured the medical doctor asserts, "We are confident that Egypt's next president will be Mohamed Morsi." 23:45 El-Erian states that only 250 polling stations – representing 2 per cent of the total – have completed tallying the votes, adding that their man, Morsi, is in the lead. 23:37 The Brotherhood's Freedom and Justice Party announce in a press conference that the countrywide voter turnout was 50 per cent. The party thanked the Egyptian people, who voted freely for the first time in history. Morsi is leading the vote count across the country, according to the their spokesman, who adds that a preliminary vote tally will be announced after a few words by well-known party member Essam El-Erian, vice president of the FJP. Hamdeen Sabbahi finished first in Al-Semad polling station in the Red Sea governorate of Suez, earning 496 votes. Morsi follows, while Moussa trails in third. In Al-Horreya polling station, Sabbahi also finished first, gaining 811 votes, followed by Abul Fotouh and Moussa. 23:18 Dozens of polling stations across the country have begun to submit their results to their district's general electoral committee. As the results begin to trickle in, it is too early to make any sweeping conclusions, however Brotherhood candidate Morsi appears to have a slight lead over rivals Abul-Fotouh, Shafiq, Moussa and Sabbahi. Al Jazeera Mubashir reports that Shafiq leads in two polling stations in the Upper Egyptian governorate of Sohag, while Al-Ahram's Arabic-language news website reports that Morsi is leading in two polling stations in the governorates of Beheira and Sohag. Former regime figures and the Brotherhood aren't the only ones with cause for cheer. Our correspondent Lina El-Wardani, reporting from Alexandria, reports that Nasserist candidate Sabbahi has a substantial lead in two polling stations. 23:12 Voter turnout in the Delta governorate of Gharbiya reached 40 per cent in the two-day electoral process, El-Sayed Abdel-Moati, the governorate's secretary-general stated Thursday evening. Boasting 2.9 million registered voters, Gharbiya is one of Egypt's larger governorates. 23:09 Across Egypt's 13,000 polling stations, vote counting is underway. After the electoral sub-committees, which are operating out of each polling station, finish the vote count, the station's presiding judge will announce the results to a representative from each of the eleven presidential campaigns. The representative must then sign off on the final tally before the judge transmits the results to each district's general electoral committee. The aggregated results will then be sent to the Supreme Presidential Electoral Commission. 22:57 According to the Muslim Brotherhood's website, Ikhwanweb, Mohamed Morsi's campaign will hold a press conference shortly to announce preliminary results of the vote count. 22:33 The Salafist Al-Nour Party has announced that it will not recognise results coming from polling stations where vote counting was carried out in the absence of campaign representative. The party, which officially backed presidential hopeful Abdel-Moneim Abul-Fotouh, warned in a statement Thursday night against any manipulation of the vote count. The statement added that the party would take all legal and "popular" (demonstrations, etc) measures to thwart any attempt to manipulate the public will. "The counting process is going smoothly in Zamalek's busiest polling station. Amr Moussa and Ahmed Shafiq seem to be leading so far. Islamists are way behind, including the Muslim Brotherhood." 22:07 Our correspondent Lina El-Wardani, reporting from the Ras El-Teen polling station (5,116 votes), reports that Nasserist candidate Hamdeen Sabbahi appears to be ahead in the district. All 13,000 polling stations in Egypt are shutting their doors after two days of voting in Egypt's first genuine multi-candidate presidential elections. Earlier on Thursday, the electoral commission extended voting hours until 9pm. While some stations have already begun counting votes, others are still waiting until all remaining voters have cast their ballots. Military and police are on high alert to safeguard the ballot boxes throughout the counting process. The primary vote count will be performed by the electoral sub-committees inside the polling stations. Each sub-committee will inform the candidates' campaign offices of the total number of votes cast in their favour. How to confront the tragedy? The supporters of all candidates other than Mursi & Shafiq must confront this tragedy now, before it is too late. Boycotting the second round of elections may not bet effective enough. The best way is to ask Egyptians including the non-Muslim Egyptians to go to the ballot boxes but cast a BLANK VOTE, rejecting both Mursi & Shafiq. On the basis of the overwhelming number of the blank votes Egyptians should demand a new presidential election.// Abul Futuh seems to be the most appropriate presidential candidate for all enlightened forces including moderate Muslims to rally around, and El Baradei the most suitable personality to head the new interim government with full authority replacing the generals. The most disappointing and sadening point to me is the low turnout in Upper Egypt for example especially in Luxor and Qena Gouvernorates with less then 30 percent. Those people who did NOT go to vote in such high numbers don't deserve ANY president, they just deserve someone to beat them until they wake up. But please: Nobody in those low turnout areas should ever complain again about the bad situation in Egypt! Shame on you! Other ones died for democracy in their hundreds and thousands - and you waste your legal democratic rights! if the muslim brotherhood takes over the country there will be serious *** going on because muslims. we all know what they do they bomb places and we all know that, it will be bad news for christians if mursi wins because this will cause death if he wins. So far the Islamis (Mursi & Abul Fotouh) have a combined of 43% while the Liberals have 56%. Meaning Egypt doen't want an Islamic state, however, will or can the Liberals unite behind Sahfiq? Are you delusional? Shafiq isn't a liberal... he's a military fascist and a criminal. Weren't SPEC claiming 50% turnout and 0ver 50 million registered voters? If so, seems like we have around 9 million missing votes. A little more than 10% I think. The thing about democracy is: countries always get the governments they deserve. You voted for these people, now deal with it. There are no foreign powers or dark conspiracies here, only the overwhelming reality that as a nation Egypt chooses to go backwards. Egypt voted for the revolution (Sabbahi + Foutouh) at over 40%. And democracy, with Moussa adding on another 10%. They didn't vote Islamist or NDP (Moussa was never in the NDP). Both of which were far lower and detested by the majority. Egypt chose a modern revolution. The system chose the old way. The results shows Mubarak regime leftovers are still strong and active. Mursi Vs Shafiq mean Shafiq will be new president. Lets hope best for country.